I am proud to be partnering with Thrive® Algae Oil to bring you this tasty recipe! As always, all opinions are 100% my own. 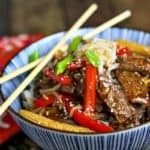 Cook thinly sliced beef quickly at high heat and you can skip the marinating time without sacrificing tenderness or flavor with this short-cut Korean Beef Stir Fry recipe. 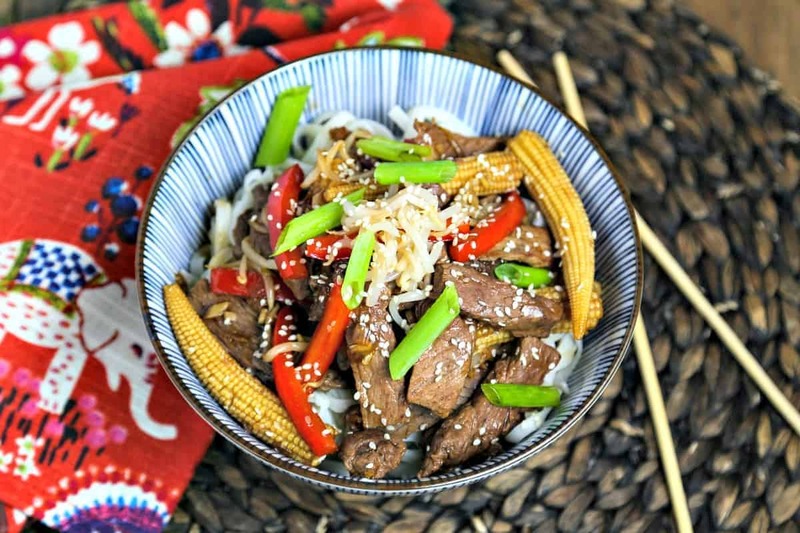 Served over lo mein noodles or rice, Korean Beef Stir Fry is a blend of tender slices of beef and crunchy, colorful veggies cooked together with a sweet sauce made with soy sauce, garlic, and freshly grated ginger. Often, authentic Korean stir fry incorporates a grated Asian pear to add sweetness. For this recipe, I use dark brown sugar and mirin, a subtly sweet rice cooking wine, instead. Some people shy away from doing stir fry at home because of all the slicing and dicing required, but with just a little planning ahead, today’s recipe comes together quickly and almost effortlessly! French chefs religiously practice mise-en-place—the practice of measuring, peeling, dicing, slicing, or grating ingredients—before they start the cooking process. 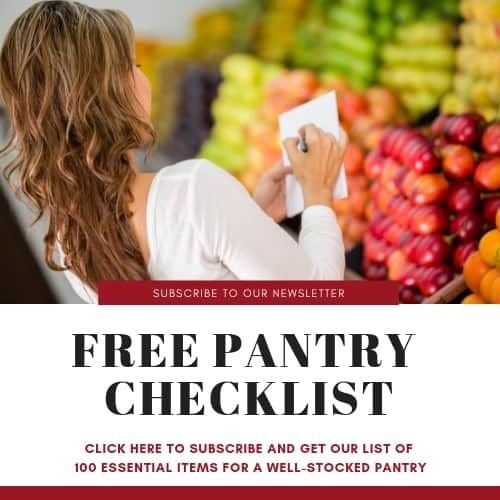 Doing this ensures that everything is at the ready to be tossed in at the appropriate step in the recipe preparation. Think about all the kitchen stress you could avoid by making this a regular practice! 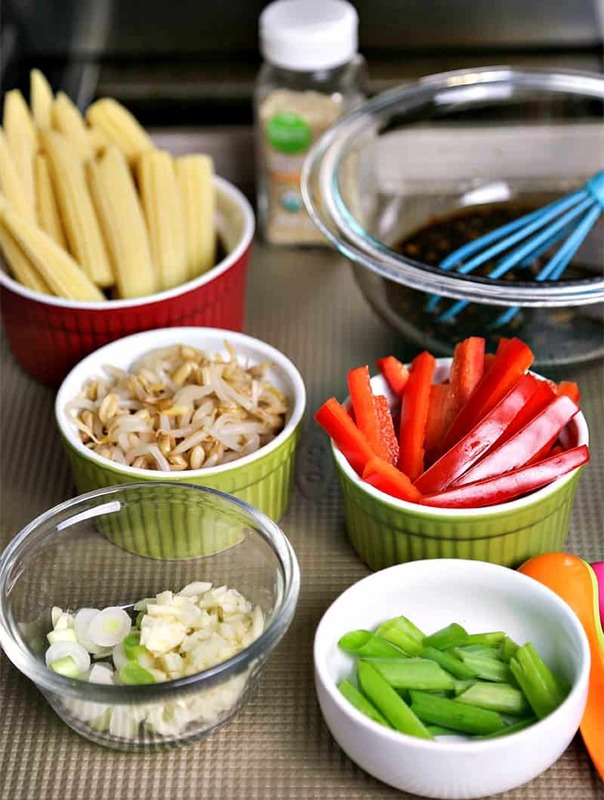 Another helpful and better-for-you cooking tip is using Thrive® Algae Oil in stir fry recipes. It has a high smoke point (up to 485°) which means it doesn’t burn at high temperatures. It also has the highest levels of monounsaturated fat—the good fat that is more heat stable—and lowest levels of saturated fat of any cooking oil. I was a little skeptical the first time I tried, but found that it’s light, neutral taste also works well in salad dressings, like this tasty mustard vinaigrette in Grilled Panzanella Skewer Salad. 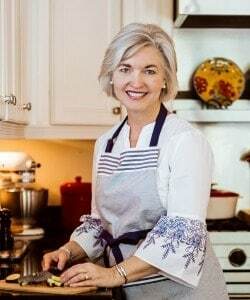 If you haven’t tried cooking with Thrive® Algae Oil—and you live in the Southeast—you can see for yourself at a special tasting event on Sunday, May 20, from 11am-3pm at participating Publix stores. If you’re not in the area, you can find Thrive® on Amazon! 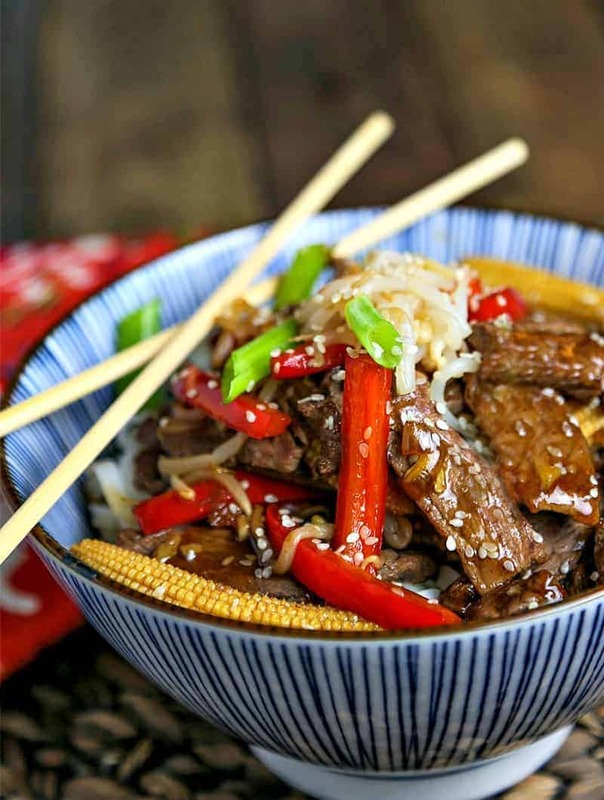 Cook thinly sliced beef quickly at high heat and skip the marinating time without sacrificing tenderness or flavor with this short-cut Korean Beef Stir Fry recipe. Thinly slice steak across the grain; set aside. Mince 1 clove garlic and place in a small prep bow. Thinly slice the white potion of the green onions and add to the garlic. Diagonally slice the green portion of the onions into 1/2-inch pieces and place in another prep bowl. Slice red bell pepper into thin slices (julienned) and place in a prep bowl; set aside. Drain baby corn and bean sprouts. For the sauce, in a small bowl stir together 2 tablespoons water and 2 teaspoons corn starch until smooth. Add the remaining sauce ingredients and whisk until combined; set aside. 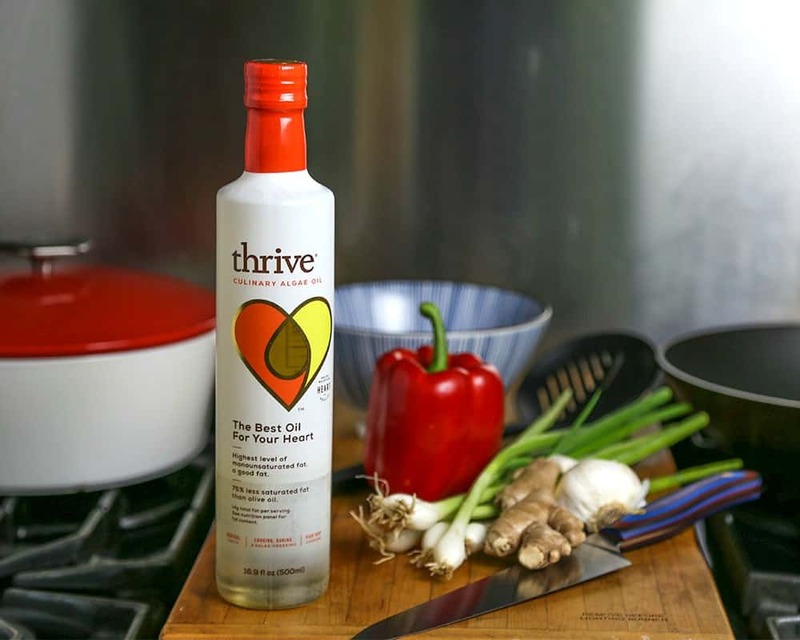 Add Thrive Algae Oil to a wok or large cast iron skillet and heat on high. Add the bowl of garlic and onion—it should sizzle immediately—and cook and stir until fragrant, about 30 seconds. Add the beef and cook until no longer pink, about 4-5 minutes. Add the red bell pepper and cook for 1-2 more minutes, stirring frequently. Add baby corn and the sauce and cook until thickened. Stir in the bean sprouts. Remove from heat and serve over lo mein noodles or rice and garnish with the remaining bean sprouts, green onions, and sesame seeds, if desired.